Is Your Website Ready for This Busy Back-to-school Season? The start of a new school year marks both an exciting and nerve-wracking time for many. With the arrival of new students, new classes and an entirely new routine, it’s important that teachers and students alike feel comfortable in those first weeks back in the classroom. Obviously, your Student Service Team will be overwhelmed with inquiries, requests, concerns and doubts during these busy last weeks of August and first weeks of September. So how to go through the next school year with happier staff, more content students and more peace for your Support Team? To help your Student Service get everything in order and don’t get too stressed about heading back to work, try a smart tool that takes just a few minutes to set up and running on your website. Lots of educational institutions worldwide are already taking great advantages of Live Help software since adding it on their sites. What are the benefits of using Live Chat on your website? A Live Help tool significantly reduces the volume of telephone calls and email inquiries. With their drastic increase during the busy back-to-school season many institutions simply cannot afford to cope with them without increasing their staffing. Live Chat provides your staff with a great ability of multitasking with no need to expand your support team. A single representative can easily chat with multiple visitors at the same time without any stress. It’s no secret that nowadays young people mostly prefer online channels as methods of communication. With Live Chat on your website you give your visitors an easy way to get immediate assistance from any device connected to the Internet. The Live Help support button on your website pages will show them that you are ready to assist them instantly and impart a modern, professional image. Live Chat provides a rich set of features to accelerate your online communications. To name a few, your operators would be able to transfer files such as brochures, application forms, schedules and images; send links instead of explaining and describing the details; use pre-written “canned” answers to give instant responses to common questions, and hot key combinations to make less mouse clicks while operating the Live Chat Operator Console. With its powerful and handy features, no wonder that Live Chat has become the number one support tool for colleges, universities and training centers. If your website doesn’t have it yet, try Provide Support Live Chat software by starting with a 10-day free Trial. 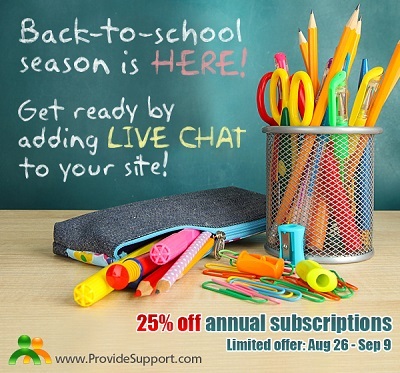 And what’s more, we’re running a Back-to-school Promo from August 26 through September 9 and giving away 25% off annual Live Chat subscriptions. Hurry up to claim in our support chat your discount and good luck in the new school year! This entry was posted in Articles, News and tagged back-to-school promotion, discounts, Live Chat software for educational websites. Bookmark the permalink. Back-to-School Season: a great opportunity for almost every business. Are you ready?